When one considers the life of Nikolai Karlovich Medtner it is impossible not to be amazed by his strange, tragic and yet marvellous destiny. He was recognized in Russia at the beginning of the twentieth century as one of the most important composers and was, with Scriabin and Rachmaninov, an extremely influential, almost ‘cult’ figure for a whole generation of the Russian intellectual élite. He was also a great pianist and an outstanding musical thinker. His personality was completely divorced from everyday life, but the depth and power of his intellect, entirely absorbed in music, philosophy and the history of culture, were deeply respected by such contemporaries as Nikisch, Rachmaninov, Furtwängler, Koussevitsky, Glazunov and Prokofiev. There is thus something of a paradox in the fact that for the last thirty years of his life, when he lived in the West, he remained practically unknown to the general public and spent most of his life in abject poverty. His music is the subject of a similar paradox. More than half a century of composing saw his style change remarkably little; critical reaction, however, differed wildly. Some thought of him as an innovator where others considered him an arch-conservative. Some felt he was the heir to the great Germanic tradition, while others spoke of his Russian soul and his ability to capture in his music the atmosphere of Russia at the turn of the century. It would seem, then, that neither the composer’s personality nor his musical style can be analysed within the limits of a single tradition, be this even the rich tradition of a Russia or Germany. This ambivalence stems from Medtner’s own origins. Since Peter the Great had, in the words of Pushkin, ‘opened a window into Europe’, thousands of foreigners had been living in Russia. This strange community, which juxtaposed European roots with the changing environment of Russia, formed a unique part of Russian life and produced many remarkable figures—men of art, science and politics. Medtner’s ancestors probably left Germany in the eighteenth century, and he was born in Moscow. Both his personality and his music evince a combination of Germanic tendency to weighty philosophizing and typically Moscovite spirit. The beginning of Medtner’s artistic activity came at a time which many consider to have been one of the high points in the history of Russian culture. This era is known as the Silver Age, or the Russian Renaissance. At the turn of the century the arts, music and philosophy were flourishing in Russia; the revolution of 1917 brought this unique period to an end. Like Scriabin and Rachmaninov, Medtner expressed the raw nerve of this momentous time: his contemporaries noted the ‘psychologically intense, demonic’ character of his music. Yet the composer used the ‘eternal laws of music’ alongside these more elusive, transient and indefinable principles. Much later, in 1930, in his book Muse and Mode he analysed with scientific precision the basic elements of the language of music (melody, harmony, rhythm), interpreting them in the spirit of the classical tradition of the nineteenth century and repudiating the whole development of modern music. Thus Medtner’s music is not easy to understand because of its complicated combination of entirely different elements: the fusion of German roots and Russian spirit, the quest for new musical expression and dedicated conservatism, a rare intelligence and almost childlike naïvety. What was the genesis of Medtner’s style? He considered himself a follower of Beethoven and the best of his work reflects the great polyphonic skill, the detailed development of short compact motifs, and the severe spirit and concentrated depth of the late Beethoven sonatas. No less important for Medtner was German Romanticism in general and Schumann’s legacy in particular. Goethe (with whom Medtner’s great-grandfather was acquainted) was a permanent source of inspiration for him. Medtner was often compared with Brahms and there are indeed comparisons to be made: the deep seriousness of his music, some of the special harmonic features, the interest in intricate cross-rhythms, and piano-writing. Nevertheless, it would be a great mistake to consider him neo-Brahmsian. Medtner never imitated anybody and was, moreover, not noted for his interest in Brahms’s music. The similarities are rather the result of their independent development of the commonly inherited Romantic tradition. Comparison of Medtner and Rachmaninov is more justifiable. They were great friends for most of their lives and they influenced each other in many ways. Medtner was enchanted by the beauty of Rachmaninov’s melodies and Rachmaninov was highly impressed by Medtner’s quest for new harmonies and rhythms. It is significant that Rachmaninov dedicated to Medtner his Fourth Piano Concerto, the most explicit instance of this mutual inspiration. The best of Medtner’s music represents something very special, and it is unmistakable: the melodies and harmonies are inimitable in the way they are drawn from the piano, an instrument cherished by Medtner as much as by Chopin. Today, forty years after Medtner’s death, we see that the heroic, self-sacrificing work to which he devoted his whole life was not in vain. His music, imbued with the strength of his powerful spirit and the beauty he believed in, is discovering a new life. 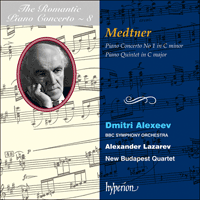 Of the three Medtner piano concertos the first is remarkable for its inspirational inner content, the beauty of its melodies and the grand scale of its structure. It is probably his most outstanding work. He began it in 1914 and the first performance took place in Moscow on 12 May 1918, the composer as soloist under Koussevitsky. The horrible events of the First World War are, perhaps unavoidably, reflected in the work. Russian and German cultures meant equally much to Medtner and the war between the two countries developed into a personal tragedy for him. The Concerto is a grandiose, one-movement construction, written in sonata form, where the extended development of each section compensates for the lack of the traditional division into movements. Slow and scherzo-like episodes sound almost like the middle movement of a symphony and the coda, which is thematically and dynamically rich, serves as a finale. The originality of the Concerto’s form is increased by the interfusion of two structural principles: the sonata form gives the work its general contours while the variation form imparts diversity, contrast and a more fragmentary structure. The work opens with four introductory exclamations anticipating the appearance of the main theme, full of heroic yet tragic pathos. The thematic concentration of the Concerto’s musical material is remarkable: the main theme serves as the source for the two lyrical subjects, as well as for every other important section. The development is very unusual: it consists of a theme and a cycle of variations. Here the composer develops fragments of all the main themes of the Concerto with considerable polyphonic skill. The short recapitulation is extremely dynamic, and the coda presents the last climax of the Concerto. Medtner somewhat delays the outcome by leading the themes through a number of odd modulations and unusual harmonies: only at the very end do we hear a triumphant hymn in C major, followed by three final bell-like ringing strokes on the piano. Parmis tous les éminents compositeurs de concertos pour piano du vingtième siècle, personne ne contribua plus grandement au genre—en relation à sa propre productivité musicale—que Nikolai Medtner. Pendant que ses contemporains Rachmaninov, Bartók, et Prokofiev—pour ne mentionner que ces trois figures contrastantes et connues—léguèrent une série de concertos pour piano, dont la plupart font maintenant partie du répertoire international, il est vrai que l’appréciation de leur dons artitisques individuels en tant que compositeurs ne serait pas si différente si aucun d’eux n’avait composé de concertos pour piano. Cependant, en ce qui concerne Medtner, ses trois concertos constituent ses œuvres musicales les plus importantes. Il ne composa pas de symphonies, de concertos pour autre instruments, d’opéras, ou de quatuors à cordes: ses concertos pour piano sont la partie la plus importante et publique de son œuvre. Alors que sa musique pour violon et piano—le répertoire le plus significatif de ce genre par un compositeur russe—comprend des œuvres plus longues que ses concertos (comme par exemple, la deuxième et troisième sonates), les compositions de Medtner pour piano et orchestre sont le fruit de toute une vie. Medtner fut un éminent pianiste. Il fut reconnu comme tel dès sa jeunesse: en 1900, alors qu’il n’était agé que de vingt ans, il obtint la Médaille d’or du Conservatoire de Moscou, ainsi que le prix Anton Rubinstein à Vienne. Vasily Safonov, directeur du Conservatoire, mentionna à Medtner qu’il aurait dû recevoir non pas une Médaille d’or, mais une en diamant. Eventuellement, Medtner eut à choisir entre deux carrières, l’une en tant que virtuose, et l’autre en tant que compositeur. Il vit le jour à Moscou, et fut élevé en Russie par ses parents de nationalité allemande, ce qui peut expliquer ses qualités uniques: son professeur de composition, l’éminent Serge Taneyev, dit de Medtner «qu’il fut né en compagnie d’une forme sonate», un énoncé qui ne pourrait certainement pas s’appliquer à tous les compositeurs russes du dix-neuvième siècle, avec comme exception Rachmaninov, ami de Medtner. Ce fut sa maîtrise rapide de la forme sonate, le coeur même de la musique classique et romantique allemande, ainsi que sa grande détermination de mouler sa maîtrise du genre à ses propres besoins de composition de grandes œuvres musicales, qui constituent la base de son art. La forme sonate est, en essence, tonale, avec ses relations entre les clés: le tempérament de Medtner se trouva plus en sympathie avec ce qui était considéré superficiellement comme les éléments musicaux traditionnels, qu’avec les nouvelles sonoritées de Stravinsky, Roslavets, ou Mossolov. Lorsqu’en 1914 Medtner commença la composition de son premier concerto pour piano en do mineur, ce ne fut pas un «Opus 1» comme l’œuvre de Rachmaninov l’avait été vingt-trois ans auparavant, ou une «musique de jeune homme» comme dans le cas des premier et deuxième concertos de Prokofiev (ses deux concertos pour piano précèdent le premier concerto de Medtner); non, ce fut un travail considéré à long terme par le compositeur qui était, tout comme Rachmaninov ou Prokofiev, un maître de l’instrument, et possédait une connaissance assez approfondie de la forme sonate pour créer une structure originale dans un mouvement séparé de la forme traditionelle de concertos à trois mouvements. Le Premier Concerto de Prokofiev, dans un mouvement de quatorze minutes, est basé sur cette forme traditionnelle: l’œuvre de Medtner ne l’est pas. Medtner composa le Premier Concerto en trois ans, le complétant en 1917 et le dédiant à la mémoire de sa mère. La première performance eut lieu à Moscou le 12 mai 1918, avec comme soliste le compositeur lui-même; le chef d’orchestre était Serge Koussevitsky. La partition fut publiée par la maison d’édition de l’État en 1921, et une réduction pour deux pianos fut publiée l’année suivante. Cet enregistrement est basé sur la première édition. Medtner avait, dès 1922, déjà choisi de quitter la Russie, mais il y retourna pour y donner plusieurs concerts en 1927, et présenta son Deuxième Concerto pour piano (Opus 40, aussi en do mineur) à Moscou. L’œuvre fut dédiée à Rachmaninov. En retour, Rachmaninov dédia son Quatrième Concerto à Medtner. Comme dans le cas de plusieurs russes d’avant la Révolution, Medtner était mal à l’aise dans la nouvelle Russie. Il vécut à Berlin et Paris, avant de s’établir au milieu des années trentes à Londres, où il vécut jusqu’à sa mort en 1951 quelques semaines avant son soixante-douzième anniversaire. Pendant la Deuxième Guerre Mondiale, Medtner commença de plus en plus à souffrir de problèmes cardiaques, mais il trouva assez de force pour compléter une série de magnifiques enregistrements de ses grandes œuvres d’après-guerre. A la fin de sa soixantaine, avec son pays natal au sommet de la Guerre Froide, ainsi qu’une santé qui se détériore graduellement, il sut qu’il ne retournerait jamais en Russie. Malgré son éloignement, et le fait qu’il était devenu une figure connue et aimée de la vie musicale anglaise, Medtner ne vacilla jamais en ce qui concerne sa foi profonde orthodoxe. Dans son œuvre importante finale, le superbe Quintette pour piano de 1950, le grand sérieux qu’il prit dans son art, ainsi que dans sa religion, sont unis comme jamais auparavant dans cette œuvre, tout comme si ses derniers moments musicaux devaient être alliés à sa foi. L’œuvre est inspirée d’un matériel musical esquissé en 1904 pour un ensemble similaire. La première performance du quintette eut lieu au Kingsway Hall à Londres, le 6 novembre 1950; le pianiste était Colin Horsley avec le Quatuor Aeolian. Au même programme, Colin Horsley fut accompagné par Manoug Parikian dans la performance de la Sonate pour violon No 1, et Gerald Moore accompagna Elisabeth Schwarzkopf dans une extensive succession de chants. Unter allen namhaften Komponisten von Klavierkonzerten im Zwanzigsten Jahrhundert hat keiner einen—imVerhältnis zu seinem eigenen Werksganzen—bedeutenderen Beitrag geleistet als Nikolai Medtner. Wenn auch jeder seiner Zeitgenossen Rachmaninow, Bartók und Prokofjew—um nur drei verschiedenartige und wohlbekannte Persönlichkeiten zu nennen—eine Reihe von Klavierkonzerten hinterließ, von denen mehrere Einlaß ins internationale Repertoire gewannen, so wäre doch die Einschätzung ihrer individuellen Statur als Komponisten kaum anders, wenn keines ihrer Klavierkonzerte geschrieben worden wäre. Im Falle von Medtner bilden jedoch seine drei Klavierkonzerte den wichtigsten groß angelegten Bestandteil seiner Musik. Er schrieb keine Sinfonien, keinerlei Konzerte für andere Instrumente, keine Opern oder Streichquartette: seine Klavierkonzerte zeigen uns seine Musik in ihrer am breitesten ausgedehnten, öffentlichsten Erscheinungsform, und obwohl seine Kompositionen für Geige und Klavier—das bedeutendste jemals von einem Russen komponierte Werksganze solcher Art—längere Arbeiten als die Konzerte enthalten (nämlich die Dritte und Vierte Sonate), so bilden doch die Kompositionen für Klavier und Orchester den Gipfel seines Lebenswerkes. Medtner war ein hervorragender Pianist. Schon früh wurde er als solcher erkannt: im Jahre 1900 gewann er im Alter von nur zwanzig Jahren die Goldmedaille des Moskauer Konservatoriums und den Anton-Rubinstein-Preis in Wien. Der Direktor des Konservatoriums, Wassily Safonow, sagte zu Medtner, daß ihm keine Goldmedaille, sondern eine diamantene Medaille hätte verliehen werden sollen. Schließlich mußte Medtner jedoch seine Wahl zwischen einer Laufbahn als virtuoser Pianist oder als Komponist treffen. Obwohl er in Moskau geboren und in Rußland aufgewachsen war, waren seine Eltern Deutsche, und dies mag dies mag der Grund für seine einzigartige Begabung gewesen sein: sein Kompositionslehrer, der große Serge Taneyew, sagte über Medtner, daß er „mit der Sonatenform geboren“ worden sei, eine Behauptung, die sicherlich nicht auf irgendeinen anderen russischen Komponisten des neunzehnten Jahrhunderts, mit möglicher Ausnahme von Medtners Freund Rachmaninow, zutreffen würde. Es waren Medtners frühe Beherrschung der Sonatenform, dem Herzstück der deutschen klassischen und romantischen Musik und sein lebenslanges Bemühen, diese Beherrschung seinen eigenen Bedürfnissen in groß angelegten Werken anzupassen, die die Grundlage seiner Kunst darstellen. Das Wesen der Sonatenform ist tonal; es besteht aus Relationen von Tonarten: seinem Temperament nach besaß Medtner ein größeres Einfühlungsvermögen mit den Elementen der russischen Musik, die oberflächlich als traditionell betrachtet werden, als mit den neuen Klängen von Strawinski, Roslawez oder Mossolow. Als Medtner 1914 sein Erstes Klavierkonzert in C-Moll begann, war dies kein „Opus 1“, wie Rachmaninows es dreiundzwanzig Jahre früher gewesen war, oder die „Musik eines jungen Mannes“, wie es Prokofjews Erste und Zweite Konzerte waren (Prokofjews zwei Klavierkonzerte entstanden früher als Medtners Erstes Klavierkonzert); nein, dies war ein in großem Stil angelegtes, sehr bewußt konstruiertes Werk von einem Komponisten, der, wie Rachmaninow oder Prokofjew, ein Meister des Instruments war, und der die Sonatenform gut genug beherrschte, um in einem einzigen Satz, der in keinem Zusammenhang zur traditionellen dreisätzigen Konzertform stand, eine originale Struktur zu erschaffen. Prokofjews Erstes Konzert läßt, obwohl es aus einem einzigen vierzehnminütigen Satz besteht, eine „Drei-Satz“-Herkunft gut erkennen: bei Medtner ist dies nicht der Fall. Medtner brachte drei Jahre mit der Arbeit am Ersten Konzert zu, vollendete es 1917 und widmete es dem Gedenken an seine Mutter. Die erste Aufführung, mit dem Komponisten in der Rolle des Solisten, fand am 12. Mai 1918 in Moskau statt; sie wurde von Serge Koussewitsky dirigiert. Die Partitur wurde 1921 vom Staatlichen Musikverlag veröffentlicht, und eine verkürzte Bearbeitung für zwei Klaviere wurde im folgenden Jahr herausgegeben. Die vorliegende Aufnahme basiert auf der ersten Ausgabe. 1922 hatte sich Medtner bereits dazu entschieden, Rußland zu verlassen, kehrte jedoch 1927 für mehrere Konzerte zurück und gab zu jenem Zeitpunkt in Moskau die Erstaufführung seines Zweiten Konzerts (Opus 40, ebenfalls in C-Moll). Das Werk trug eine Widmung für Rachmaninow. Rachmaninow wiederum widmete Medtner sein Viertes Konzert. Wie viele vorrevolutionäre Russen fühlte sich auch Medtner im neuen Rußland nicht wohl. Einige Zeitlang lebte er in Berlin und Paris und ließ sich dann Mitte der 1930er Jahre in London nieder, wo er bis zu seinem Tode, der 1951, wenige Wochen vor seinem zweiundsiebzigsten Geburtstag eintrat, lebte. Während des Zweiten Weltkriegs machte ein Herzleiden Medtner zunehmend zu schaffen, aber er bot trotzdem gerade noch genug Kraft für eine großartige Reihe von Nachkriegsaufnahmen seiner bedeutenderen Werke auf. Da er schon in seinen späten Sechzigern war, sein Heimatland sich auf dem Gipfel eines Kalten Krieges mit dem Westen befand und sich sein Gesundheitszustand allmählich verschlechterte, wußte er, daß er nie mehr russischen Boden betreten würde. Trotz seiner Entfremdung von seiner Heimat, und der Tatsache, daß er im englischen Musikleben eine äußerst beliebte Persönlichkeit geworden war, wurde Medtner nie in seinem tiefen östlich-orthodoxen Glauben erschüttert. In seinem letzten größeren Werk, dem herrlichen Klavierquintett von 1950, wurden die ernsthaften Geisteshaltungen, mit denen er an seine Musik und auch an seine Religion heranging, wie nie zuvor in seinem Werk miteinander vereinigt. Es scheint so, als habe sein Abschied von der Welt durch das Medium der Musik mit seinem Glauben habe verbunden werden müssen. Das Werk umfaßt frühes, 1904 für ein ähnliches Ensemble entworfenes Material. Das Quintett wurde am 6. November 1950 in der Kingsway Hall in London zum ersten Mal aufgeführt; der Pianist war Colin Horsley mit dem Aeolian Quartet. In demselben Programm, das ausschließlich aus von Medtner komponierter Musik bestand, war Colin Horsley Partner von Manoug Parikian in der Violinsonate Nr.1 und Gerald Moore begleitete Elisabeth Schwarzkopf in einem ausgedehnten Liedvortrag.